The Sun may be a mass of incandescent gas, but in the plasmatic reaches of its solar winds spins another seemingly glowing (but relatively minute) orb. The last of the five naked-eye planets discovered in ancient times, Mercury has long been an elusive, enigmatic world. As seen from the Earth, it never emerges far from the Sun, and astronomers in the telescopic era found it challenging to work out basic data such as its rotation period, the inclination of its axis, and whether or not it possessed an atmosphere. In this fully up-to-date and beautifully illustrated account, William Sheehan describes the growth of our knowledge of planet Mercury. From the puzzles it posed for early astronomers to radar studies in the 1960s, and from the first spacecraft fly-bys by the Mariner 10 probe in the 1970s to the latest images from the Mercury Surface, Space Environment, Geochemistry, and Ranging (MESSENGER) orbital mission between 2011 and 2015, Mercury has slowly been brought into clear focus. But although we have now mapped its surface in exquisite detail, revealing strange features like volcanic plains and water-ice deposits in craters near the poles, mysteries remain—such as why its core has the highest iron content of any body of the Solar System. Rather than growing duller on closer acquaintance, this most mercurial of planets continues to fascinate us, offering important clues to scientists as they seek to better understand the origin and evolution of the Earth. William Sheehan is a psychiatrist, historian of astronomy, and amateur astronomer who has been an observer of Mercury and the other planets for many years. He is the author or coauthor of twenty books, including Planets and Perception, The Planet Mars, and Discovering Pluto. He lives in Flagstaff, AZ, and Asteroid 16037 is named Sheehan in his honor. "Mercury, the Solar System’s innermost planet, was spotted in antiquity but remained an enigma until the 1960s. Science historian Sheehan’s portrait of the body (known in ancient Greece as the “scintillating one” for its flicker) reveals it as an airless iron world with an eccentric orbit. He interleaves discoveries, from Johannes Kepler’s prediction of a transit of Mercury in the seventeenth century to NASA’s MESSENGER probe, which relayed gorgeous images and data (such as the presence of a wealth of volatile compounds on the surface) before crashing on the planet in 2015." "Sheehan's history of observation and discovery is recommended reading . . . The journey to Mercury, seen through time's telescope, has been an undertaking of centuries." "Sheehan has done a brilliant job. . . . Add to that top-quality production standards and some lovely photographs from the Mariner and MESSENGER missions, and the result is a book that easily convinced me the Solar System’s ‘least interesting’ planet is still a pretty fascinating place." 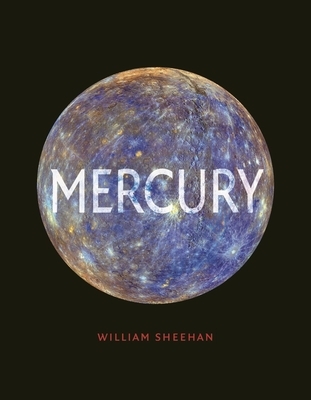 "Sheehan has crafted a brief but very informative summary of what we know about the planet Mercury and how we know it, adding to an already impressive list of books on planetary astronomy he has authored or coauthored. The new book is successfully aimed at a popular audience, but readers with prior knowledge of astronomy or planetary sciences will follow his narratives more easily. . . . This largely chronological organization from early myths to modern spacecraft works well because the understanding of Mercury grew in highly episodic fashion: key discoveries were generally separated from one another by decades of relatively little advancement. The book is lavishly illustrated . . . It is a quick, interesting, and authoritative read. Recommended."